The Brittany region of France covers a large area of land (27,208 km2). To give you some idea of the area, it is the equivalent of the combined English counties of the whole of South West England. This is important when considering where you want to holiday. Generally, it would be a mistake to try and cover the whole of Brittany during a fortnights holiday, as there is far too much ground to cover. We recommend focusing on the Morbihan region when staying at our cottage. When you have reviewed all the places to visit and activities available we think you will agree that there is more than enough to keep you entertained on a fortnights holiday. While the land area is large, there are only 3 million residents in Brittany, half the population density of SW England. This means that the roads are clear, countryside is the norm rather than towns, and you can still find (free) parking in most towns and resorts. The Morbihan is a Department in Southern Brittany similar to a County in the UK. There is some dispute as to exactly how many Departments Brittany has. The official answer is four, but as you will see on the map, many traditionalists (and guidebooks) still include the Loire Atlantique Department which was removed from Brittany by the occupying Nazi Government during the Second World War - much to the Breton's displeasure. We are located in the Morbihan region, which is definitely still in Brittany! Each of the Departments has a different feel, customs & culture, and if you do wish to go further afield to explore other regions, La Ville au Tady is ideally located near the centre of Brittany. Josselin is our nearest large town, and is one of the most attractive small towns in Brittany with a famous château on the banks of the River Oust. It has been awarded the Petite cité de caractère status, and is a three star Floral Town. Josselin was strategically located and was used in ancient times by the Dukes of Brittany as a stopping off point, hence the magnificent château. 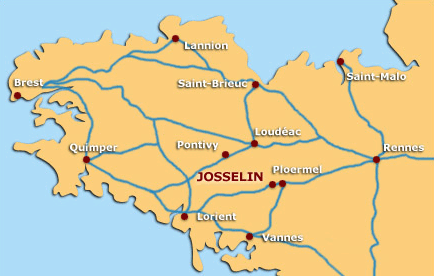 Josselin is ideally situated to visit either the north or south coast, and the beaches of the Gulf of Morbihan can be reached in about 45 minutes. An established tourist centre, there are a good selection of bars, restaurants and attractions within the town. It hosts a bustling street market each Saturday morning. There are two large modern supermarkets on the edge of town. Guegon is a prosperous and attractive small village just outside Josselin with an historic 12th century church. It is popular both as a residential area, and also for holiday home owners. La Ville au Tady is located within the Commune of Guegon, a five minute drive down country lanes from the village centre, which contains a range of local stores including a general store, two bars, florist, pharmacy and boulangerie.